Beauty, Virtue and Vice: Images of Women in Nineteenth-Century Prints is an amazingly extensive online exhibition of the American Antiquarian Society (Worcester, Massachusetts). It covers topics such as "Ideal Beauty," "Women as Objects of Beauty and Desire," "Variations on the Beauty Standard" and "Women in Public Life." It is the section on "Images of Women at Advertising Strategies" that shows the role of hair in the construction of beauty that you may find of interest. While the exhibition points out that most prints "were designed simply to please the eye... they are also useful to historians who would like to understand how nineteenth-century Americans thought about the world in which they lived. Although prints are often works of imagination (even when they are grounded in fact), they still have much to tell us about the time and place in which they were created." Trade cards and print ads were a popular mode of advertising in the nineteenth-century, particularly after the Civil War. Appealing images were used to associate beauty and leisure activities with a variety of products, from soap to cigars. In the two cases below, you'll see to what lengths illustrators went to promote (the already) popular hair tonics. Seeing the richness of this topic, I'm sorry I didn't address it in the exhibition I put together for The Museum at FIT, The Artful Line: Drawings and Prints from FIT's Special Collections of the Gladys Marcus Library. Lyon's Katharion. Sarony & Co., 1856. "Although this advertisement promotes the retail business of Heath, Wynkoop, & Co., the proprietors use the appeal of a popular restorative hair tonic, Lyon’s Katharion, to attract the attention of potential customers. Katharion (from the Greek word for “pure”) was a generic name for tonics that counted castor oil, tincture of cantharides, alcohol, and fragrance oils among their ingredients. 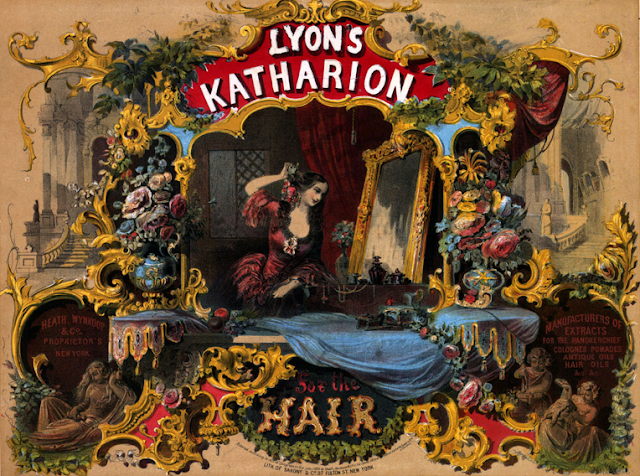 This advertising image says little about what the product actually does, but uses the powerful visual language of artistic fancy to associate itself and Lyon’s Katharion with romance, luxury, and beauty. The setting is highly theatrical. The lush-tressed young woman admires herself in a large gilt mirror (itself a very expensive luxury item) as she leans casually upon a bureau dripping with jewels. The enclosure that frames her seems like a fancifully decorated vending booth, and the architectural details at far left and right suggest that all of this is set within a grand European palace. Visual pleasures include gilt architectural embellishments, flowers bursting in bloom, lively sculptural carvings, and silky fabrics. These many symbols represent a variety of sensual comforts, and are meant to stimulate a viewer’s desire. This beautifully colored print represents a mighty promise from a little bottle of hair tonic." Hall's Vegetable Sicilian Hair Renewer. 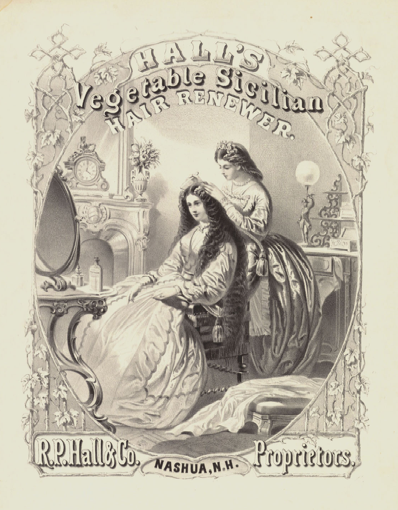 Attributed to Louis Maurer, n.d.
"Hall’s Vegetable Sicilian Hair Renewer was another popular brand of hair tonic, and as with the previous print, this one, too, capitalizes on the popularity of these name brands to advertise a retail business. This print is, in many ways, similar to the previous print advertising Lyon’s Katharion, particularly in its representation of beauty and comfort within a luxurious setting. The scenario here is a domestic one, and the young beauty with the endless tresses is being tended to by an equally beautiful, expensively dressed handmaid. All of the furnishings, and the dress of both women signal wealth and luxurious comfort. Louis Maurer, the presumed creator of this print, was an exceptionally successful American lithographer who worked for a number of major American art print publishers."